Most developers (and companies) choose Git over SVN as their version control system. However, they have to use SVN to ship updates to WordPress.org plugin repo. 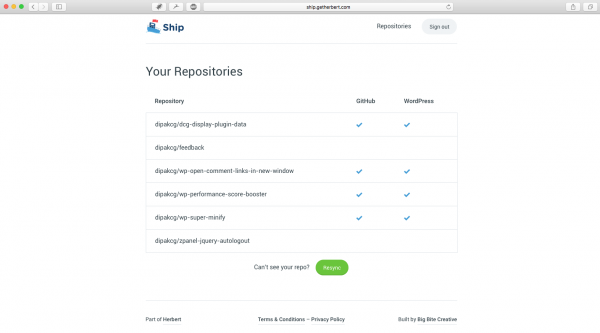 Ship is a new application designed to help developers deploy plugins directly from GitHub to WordPress.org repo. All you have to do is tag the release on GitHub and it will automatically push updates to the plugin’s official SVN repo on WordPress.org. In order to use Ship, you must have already submitted your plugin zip file to WordPress.org. You can then sign into the Ship with GitHub account and authorize its access to your repositories. Ship will then fetch all of your repositories and you’ll have to select the ones you want to hook up with a WordPress.org SVN address in order to start syncing updates. If you have any issues or feedback on Ship, you can post it on their GitHub repo at https://github.com/getherbert/ship.